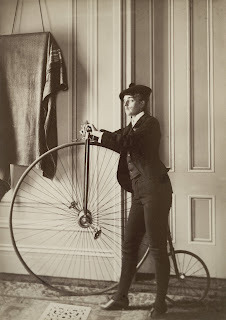 I love this vintage photo of Frances Benjamin Johnston, full-length self-portrait dressed as a man with false moustache, posed with penny-farthing bicycle. Taken between 1880-1900. To download this vintage photo just click on the image and it will open in a new window, then you can right click and save to your computer.